Three years after Gaza pullout and 81% of the evacuees are still living in temporary housing, said a Maagar Mohot Institute survey, headed by Professor Yitzhak Katz. This survey, the first large-scale one of its kind, examining the evacuees’ financial, emotional and medical situation as well as their attitude towards state institutions. The data is scheduled to be presented before the Knesset on Wednesday. According to the data, 44% of those who took part in the survey said they believe it will take at least two more years before they are transferred to permanent housing; thus prolonging their stay in the temporary structures by five years at least. 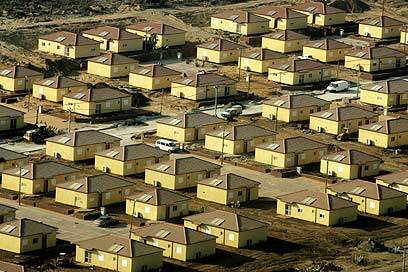 Some 67% of the Gush Katif evacuees aren’t satisfied with their temporary housing arrangement. More than 50% of them are busy job-hunting and don’t believe they can find employment and reenter the work market. The sector suffering the hardest is the agricultural one: Three years after the pullout, about 31% of the evacuees whose livelihood was agriculture-based are still unemployed. Moreover, 37% of the Gush Katif evacuees describe their situation as “bad” or “very bad.” Another 15% say they need financial aid and are being supported by relatives or friends. Some 70% of the participants claim their financial situation is far worse than it was prior to the evacuation. The survey also indicates that 69% of the evacuees don’t believe that their financial compensation will suffice in building their permanent residence, as 24% of them are using those funds for daily subsistence. The data further indicated that 42% of the evacuees estimate that the Gaza pullout changed the young generation’s attitude towards their serving in the IDF, out of which 65% feel that the change reflects the youth’s reluctance to join the IDF. About 55% of the evacuees reported suffering a deterioration in their health since the withdrawal, with 85% citing the pullout as the cause. An equal percentage required psychological care. About a third of the participants (37%) reported depression, anxiety and fear as well as various physical ailments (32%) and 13% reported insomnia. Another 29% reported worsening in the relationships within their nucleus family. The survey’s data also indicated that 96% of the Gush Katif evacuees are hurt and disappointed by the politicians and decision makers’ attitudes. Some 90% of them feel that “there’s no one to talk to” and that they must continue to fight for their rights and for the government’s fulfillment of its promises to the evacuees during the evacuation. Some 45% of the participants said they feel pessimistic about their future and the future of their families. Almost all of the participants said the government failed or failed miserably in handling the settlers evacuated from Gush Katif. Some 83% said the SELA Administration for Assistance to Settlers from the Gaza Strip and Northern Samaria failed or failed miserably in managing the evacuation, and another 80% “graded” the Knesset members’ treatment the same. Finally, 73% of the Gush Katif evacuees claimed the right-wing politicians and parties have also failed or failed miserably in taking care of them. See all talkbacks "Gush Katif evacuees suffering financial, medical problems "